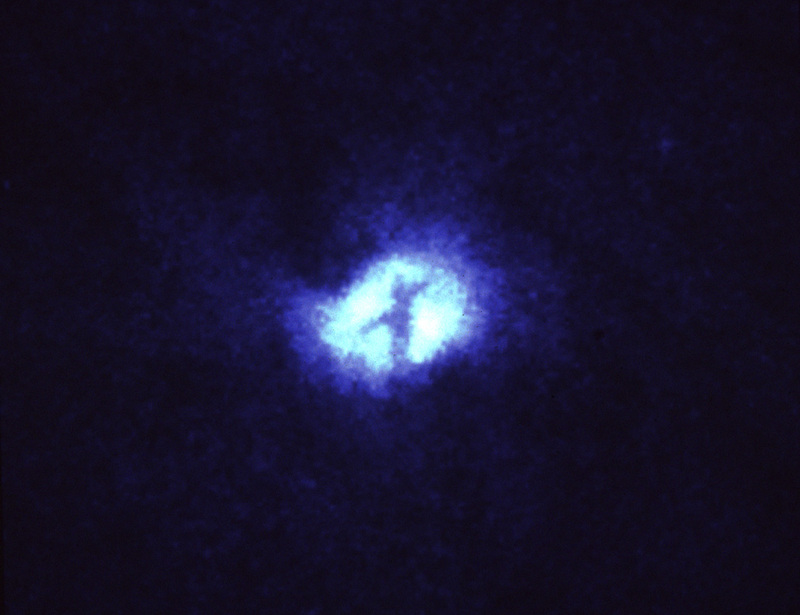 This image of the core of the nearby spiral galaxy M51, taken with the Wide Field Planetary camera (in PC mode) on NASA's Hubble Space Telescope, shows a striking , dark "X" silhouetted across the galaxy's nucleus. The "X" is due to absorption by dust and marks the exact position of a black hole which may have a mass equivalent to one-million stars like the sun. The darkest bar may be an edge-on dust ring which is 100 light-years in diameter. The edge-on torus not only hides the black hole and accretion disk from being viewed directly from earth, but also determines the axis of a jet of high-speed plasma and confines radiation from the accretion disk to a pair of oppositely directed cones of light, which ionize gas caught in their beam. The second bar of the "X" could be a second disk seen edge on, or possibly rotating gas and dust in MS1 intersecting with the jets and ionization cones. The size of the image is 1100 light-years.